This page looks at the mechanism used in William Gardner's 2-barrelled machine guns, specifically his patented design of 1879. By this time Gardner had split from Pratt & Whitney and was running his own company, the Gardner Gun Company, and manufacturing guns in the United Kingdom. 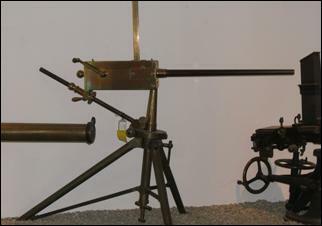 Gardner's guns, as used by the British Navy and Army and exported to various countries, can be distinguished from the Pratt & Whitney - Parkhurst designs: Spent cartridges are expelled through the sides, the cartridge magazine is a single column, and the barrels, when enclosed, are not water cooled. 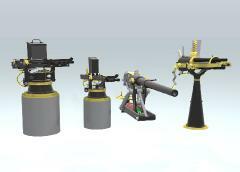 Animation of the mechanism of Gardner's 1879 patent for 1 and 2 barrelled machine guns. William Gardner designed and patented his gun mechanism in 1874, and later sold the manufacturing rights to Pratt & Whitney. 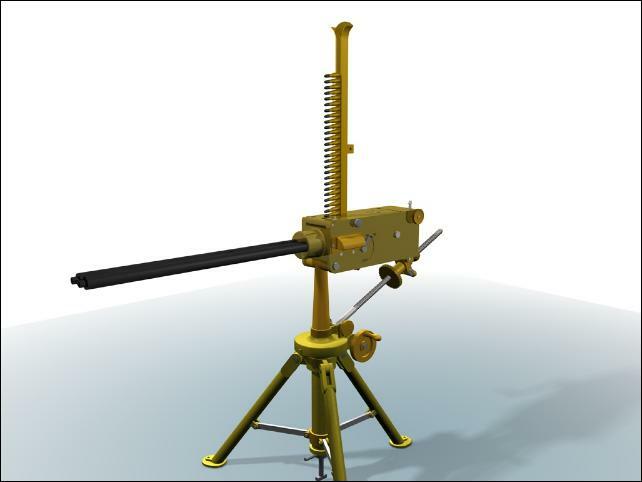 This engineering company produced a number of improvements and although demonstrating the gun to the U.S. Army over a number of years, no sales resulted. William Gardner, perhaps disillusioned by the loss of control of his invention and lack of sales, set up his own company – the Gardner Gun Company, in 1879 to manufacture Gardner guns [Gn6]. He also patented in 1879 an improved mechanism for regulating the flow of cartridges and ensuring spent cartridges were correctly ejected. Gardner and his agents demonstrated his one and 2-barrel guns to the British Admiralty, which took a great interest, and invited him to set up a manufacturing capability in the United Kingdom. The first batch of 1 and 2-barrel guns was ordered in September 1881, and delivered in March 1882. 5-barrel guns, designed to Gardner’s 1881 patented design were delivered later in July of that year. Further deliveries to the British Navy and later to the Army continued over the next few years, with over 470 recorded deliveries. The Gardner also sold his guns to Turkey, Denmark and the Netherlands [Gn6]. Gardner guns in British service were made in two models. Externally, the two models can be distinguished as the Mark I has enclosed (but not water cooled) barrels and the rear sight is attached to the outside of the casing, while the Mark II has exposed barrels and a rear sight built into the lid. The Mark I was made up to about 1885, while the Mark II came in about 1887. Both use the mechanism covered by Gardner’s 1879 patent. The barrels (the axis of which lie in a horizontal plane , and are parallel to each other) are fixed in a gunmetal casing; the fore end or barrel casing is tubular (Mark I) and the rear end or breech casing is rectangular. The top of the casing is closed in by the cover which is pivoted to the fore end of the breech casing, and is locked down by means of the cascable screw. In the breech casing are the locks which carry the mechanism for discharging the cartridges and extracting the empty cartridge cases. The locks are driven backward and forward by means of a crank disk, worked by the crank handle. At the forward motion the cartridges are pushed into the barrel chambers, and held there during the time of discharge, whilst during the backward motion the empty cases are withdrawn. The gun is fed from the vertical cartridge feeder or hopper which is slotted into the cover.The cover also has a slot through which the cartridges fall down to the cartridge carrier. 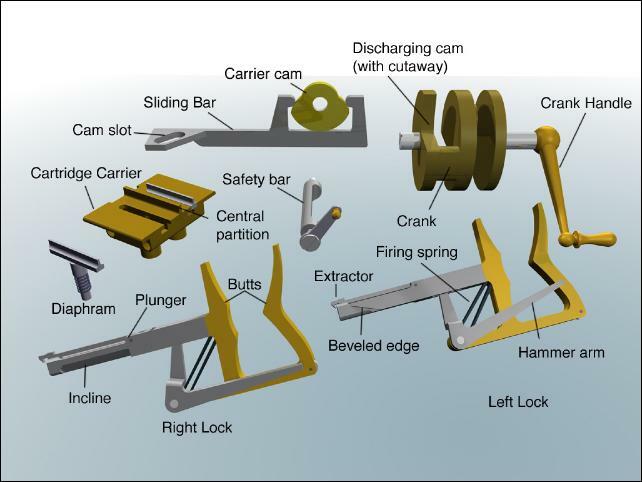 The cartridge carrier, which is at the rear of the barrels, has a transverse motion, to bring the cartridges from the opening in the cover and deliver them behind the right and left barrels alternately, where they are in line with the lock plungers. Sighting. The gun is has two sights, the fore sight, which is attached to the barrel casing, and the tangent sight (rear sight) which slides in a bracket attached to the breech casing (Mark I) [Gn4]. 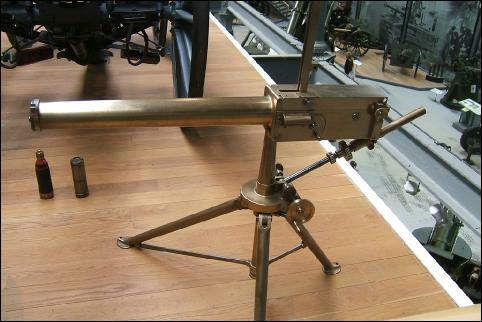 In the Mark II gun, with exposed barrels, the fore sight cannot be fixed to the front of the barrels, and is instead mounted at the front of the lid. This means that the rear sight must also be mounted within the lid to ensure the sight line is parallel to the barrels. The tangent sight is telescopic with an inner stem and an outer slide which has teeth cut to form a rack. For long ranges, the stem is pulled out, and is pushed in fully when shooting at ranges less than 1,400 yards. A spring snaps into a recess in the slide and acts as a stop when the stem is drawn out to its full extent. The slide is marked on its right edge from 100 to 1,300 yards, and on its left edge from 1,400 to 2,000 yards. The right-hand marking is for use when the head of the stem is resting on the top of the slide. The left-hand marking for when the stem is fully withdrawn. Gardner’s Patent of 1879 [Gn7] builds upon the basic operating principle covered by his 1876 patent. The rotary motion from turning a handle is translated to backwards and forwards motion by means of a crank. The locks retain a similar shape. However the improvements were designed to provide a more positive control of the cartridge loading and unloading process. At high firing rates there is a great risk of cartridges becoming jammed in the feed hopper, or becoming misaligned in the loading trough, so jamming the mechanism. Additionally, if the extractor hook on the lock failed to ride over the cartridge rim during the loading stroke, it might fail to pull the fired cartridge out of the breech, causing another stoppage. Gardner’s 1879 design solves these problems by dropping fresh cartridges into a trough situated between the two barrels, then sliding the trough sideways into line with the barrels and lock in such a way that the rim of the cartridge is slid between the face of the lock plunger and the hook of the extractor. The extractor runs in a groove in the lid and so cannot ride up to release the cartridge during either the loading or unloading stroke. Spent cartridges are then slid sideways out of the gun. The lock consists of a U-shaped rear piece, the ‘butts’, a plunger containing the firing pin, a firing hammer and a leaf spring. An extractor bar is pinned to the top of the plunger, and the heel of the lock has a small wheel to reduce friction. The U-shaped butts fit around a crank, and as the crankshaft is turned the crank drives the lock backward and forward. 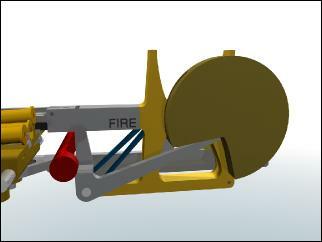 The disks either side of and between the locks act as firing or discharging cams. The long arm of the hammer is held down by the discharging cam until the moment for firing, when the cam is cut away to release the hammer and discharge the cartridge. Then as the crankshaft and cam continue to rotate, the hammer arm is forced down again compressing the firing spring and pulling the firing pin backwards out of the base of the cartridge. 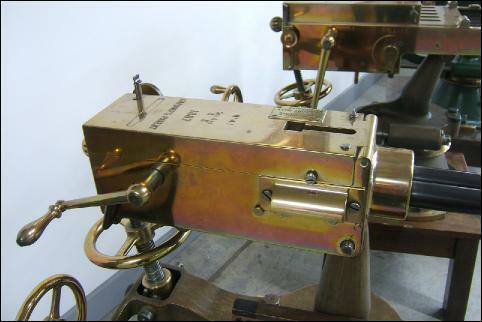 A safety bar is fitted to allow the gun mechanism to be ‘dry-fired’, that is, to practice the firing drill using live ammunition but without actually discharging any of them. prevented from flying forward when in the Safe position, but when in the Fire position, the cutaway permits the hammer full motion and the firing pin will reach the cartridge cap. The cartridge carrier has the purpose of picking up a cartridge from the stack held by the cartridge feeder or hopper and moving it sideways so that it is in line with the left or right barrels alternately. It is constructed so that the cartridge rims will line up with the gap between the plunger face and the hook of the ejector bar. The transverse motion is produced by a carrier cam attached to the crank moving a sliding bar backward and forward. The sliding bar has a flat extension with a cam slot. One of the spring cylinders extending below the cartridge carrier fits into the cam slot, and as the sliding bar moves forwards so the carrier is forced to right. As the sliding bar move backwards, the carrier is pushed to the left. The carrier has two spring loaded diaphragms which form the walls of the trough in which the cartridge first drops and ensures that the cartridge is in the correct position for loading. With the carrier to the right, a fresh cartridge will fall into the trough formed by the central partition and the left-hand diaphram. The right-hand lock will be loading a cartridge while the left-hand lock will be extracting a spent cartridge. 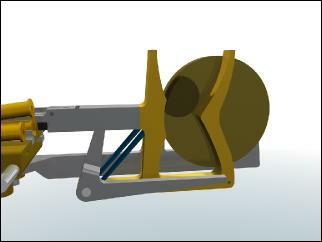 As the right lock moves forward it pushes the cartridge into the breech chamber. When the cartridge has entered the breech sufficiently so that it will not become misaligned, a bevel cut in the lock side pushes the right-hand diaphram down. When the right lock is fully forward, and the crank has rotated so that it is horizontal with the barrel (so locking the lock in position), the right lock will fire. At the same time, the left lock will be in its fully retracted position. The cartridge carrier then moves swiftly to the left. The depressed spring loaded right-hand diaphram passes under the right lock, and springs back into position. An incline is cut into the lock plunger to permit this. The movement to the left moves the trough holding the fresh cartridge in front of the left-hand lock, which is then rammed, and the left-hand is diaphram depressed. Meanwhile the right-hand lock is extracting the spent cartridge, and a fresh cartridge has dropped into the trough between the central position and the right-hand trough. When the left-hand lock fires, the carrier moves sharply to the right, and the right-hand diaphram pushes the spent cartridge out of the right-hand ejection port. 4.	take hold of the plunger and raise it, at the same time moving the crank slightly; 5.	the lock will now come away; turn the crank until the left-hand crank pin is at the top and take out the left-hand lock. 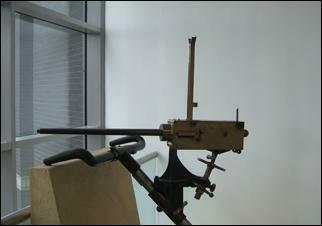 On ships, the 2-barrel Gardner gun was mounted on a cone mount. The cone mounting consists of the cone, crosshead, elevating and traversing gear. The cone fits into the standard service holding down ring. The elevating gear consists of telescopic right and left hand screws working in a nut pivoted to the cross head. It is furnished with a brake. The traversing gear consists of a worm-wheel and work and spindle. The worm-wheel is attached to the crosshead by clips. The crosshead, with elevating and traversing gear may be unscrewed from the cone and used either in the field carriage or a gunwale socket. Parapet mountings were developed at the request of the British War Office, and consisted of a light frame that could be rested on the top of a parapet to allow the gun to be fired over the top. The frame had a pair of wheels at its base to allow the gun to be rapidly moved to where they were needed to defend a fortified position from attack. Later in their service life, the guns were converted to fire the 0.303 bullet and cordite propellant. Gardner guns that have been converted will have a small warning plate fixed adjacent to the slot that holds the cartridge feeder. The Gardner gun was popular in the Royal Navy because it was relatively light, was simple to operate and maintain, and gave a reasonably high rate of fire. Light weight was important as the Royal Navy used machine guns in at least 3 types of operations - mounted in the fighting tops (masts) on warships so that they could rake the decks of enemy ships should they attempt to board or ram, in small boats, and mounted on carriages for expeditions by Naval Brigades in land actions. The following tables, from the Manual of Gunnery for Her Majesty's Fleet, 1885, give details of the various machine guns used by the Fleet with their dimensions, weights and firing rates. No. of rounds in 30 secs. 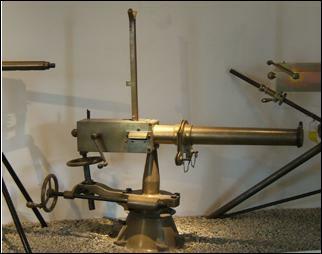 Note: The Accles magazine fitted to Gatling guns after 1883 allowed higher rates of fire and especially with the gun at extremes of elevation or depression. Cartridges were held in a 'spiral' (actually concentric rings with a step between rings) and as the gun crank was turned, cartridges were forced along the 'spiral' and into the gun's cartridge carrier. This was more positive and faster than allowing cartridges to drop under gravity. Extreme length of barrels in. Length from base of bullet to muzzle in. Note 1 - this is the weight of the tripod mount supplied with a 1-barrel Gardner gun. Note 2 - The cartridge holder for 1- and 2-barrel Gardners is a simple piece of wood drilled for cartridges. Gn1. Royal Armouries, Leeds, information for visitors. Gn6. Rifle Calibre Artillery: The Gardner Battery Gun, James W. Alley Jr. American Society of Arms Collectors Bulletin No 89.